Midplains Ag and the University of Nebraska are planning on holding the 2017 “Irrigation Field Day” on August 30. It will be held at the same location 3 miles south and 5 ½ miles west of Elgin on 836 road. 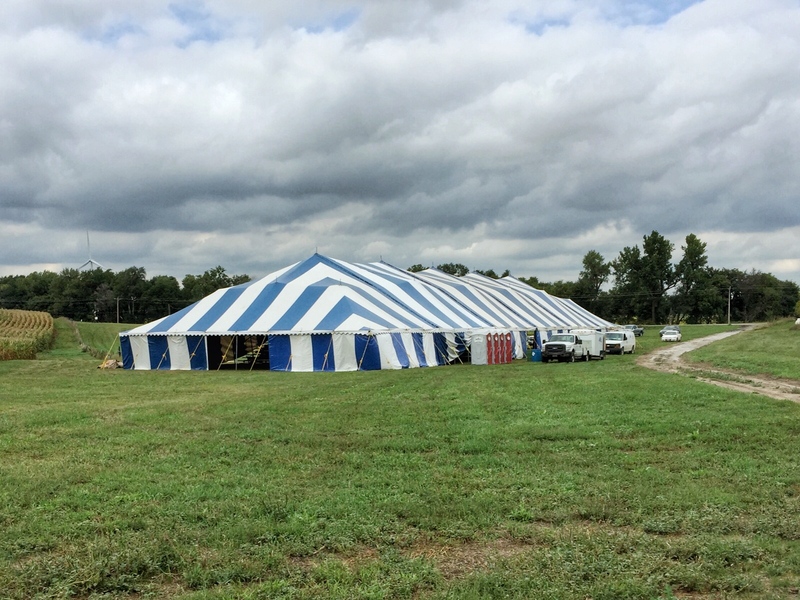 Setting up the tent for the 2016 "Irrigation Field Day"
The format will be like last year with speakers, field tours and vendor booths. We are looking at adding other demonstrations in the area around the tent. One of the most popular events at the 2016 field day was the field tour where we looked at Jain’s GeneSys Sprinkler. Here’s a photo of Brian Lewis explaining how the sprinkler works. We will be announcing more details about the 2017 "Irrigation Field Day" so stay in touch!! 2017 Irrigation Field Day webpage is live. Click the link to see the schedule and list of speakers.